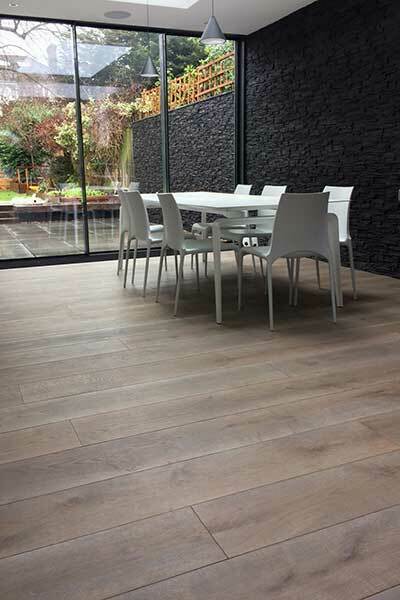 Below you will find a variety of projects featuring products from our ranges. We endeavour to provide real-life photos of the environments to show what is possible for different decors and configurations. We will be regularly updating this page to show off what is possible and hopefully provide inspiration for your project. This project was devised in conjunction with Campbell & Kaminski, interior designers based in South West London. 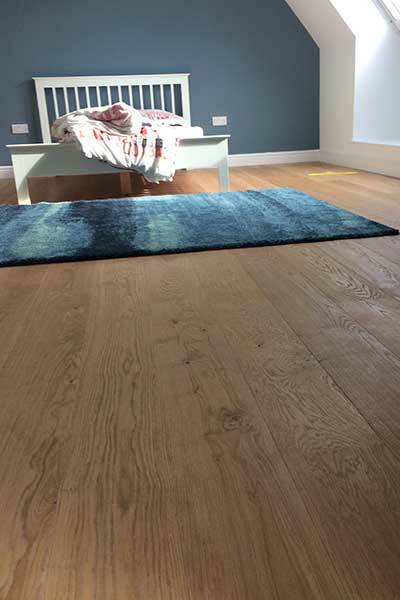 The brief for this job was to find a contemporary floor for a large, underfloor heated area over 100 square metres that had detail and interest while matching the overall colour palette, the floor matches both the décor and the indoor-outdoor affect. This was an extra wide board at 240mm with board lengths up to 2.4 metres. 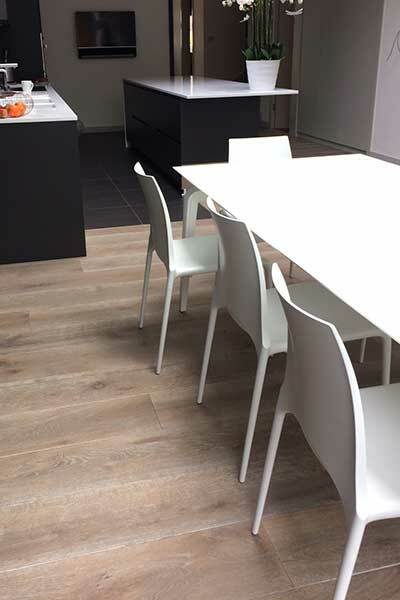 It is manufactured in Europe to the highest standards and features a brushed and oiled finish. 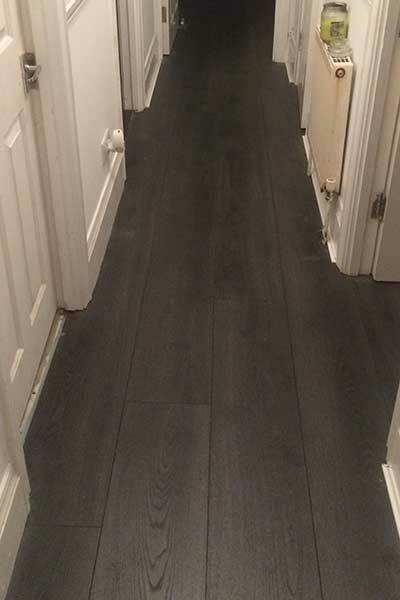 Project located in Caterham, the client was so impressed with the wide-board laminates now available that he installed this dark-coloured wide-board laminate. 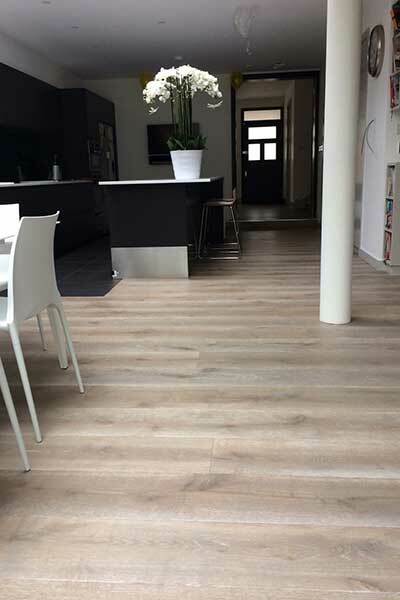 This product manufactured in Germany has a high abrasion rating and looks analogous to wood while maintaining the aspects of laminate that make it appropriate for many areas, especially flats. The charcoal colour works perfectly against the white décor, with his high ceilings and natural light it was possible to mix in the darker colours to make a really impactful statement. 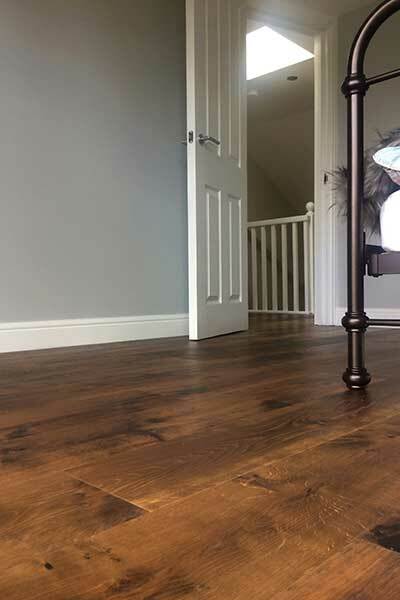 The darker colour even works in the hallway against the white skirting boards and walls. 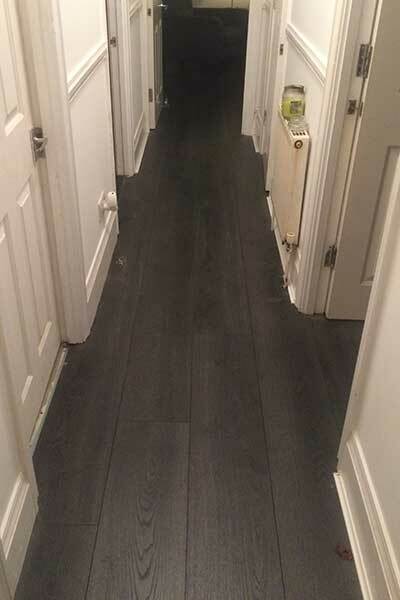 Hallways do not always work well with dark colours but in this environment the floor really works with the décor. The project was around 80 square metres. Multi level contemporary apartment in Kensington, the developer wanted a clean, crisp, modern look to enhance the overall scheme. 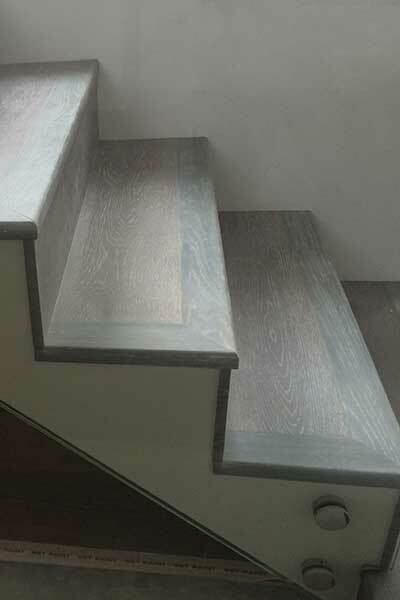 We were asked to clad a double stair case and the two main living areas. 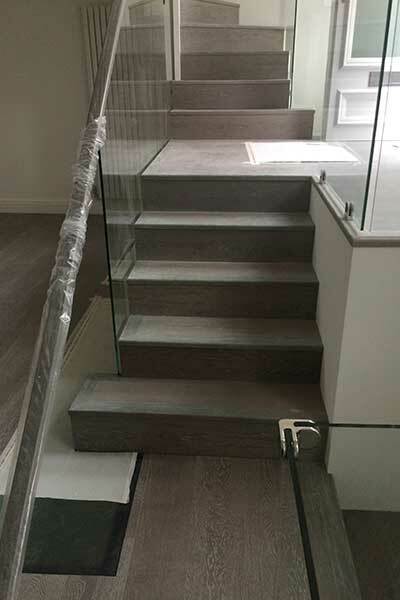 You will see from the photographs that the stairs were clad on the stair, riser and side detail, for this we also created bespoke stair-nosings to achieve the desired look. 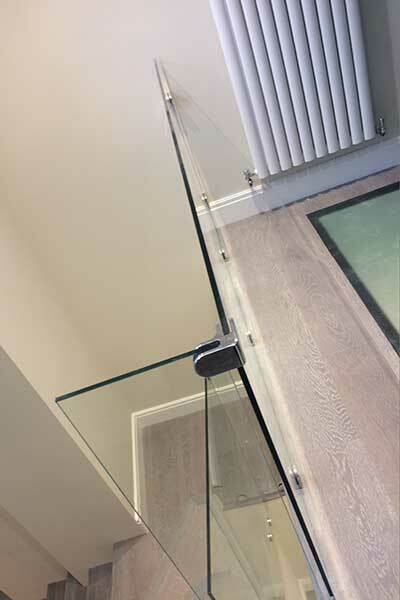 There were glass panels installed into the floor to allow light into the basement of the apartment, we worked around these panels and fitted the floor flush without any additional trims; this enhanced the overall clean-lined look of this contemporary scheme. 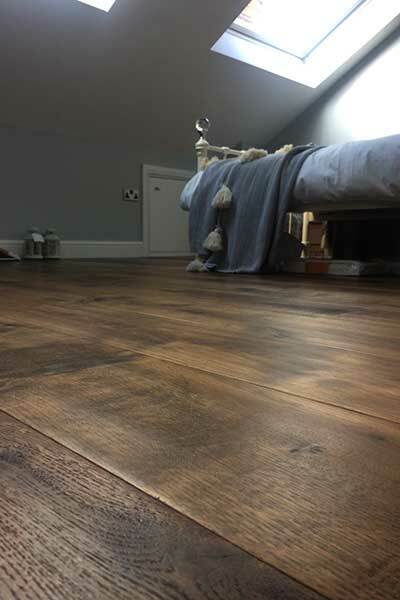 We used a German made engineered oak flooring in a nature grade, which fulfilled our customers’ requirement to have a floor that is more consistent in colour as well as fewer knots to create a more contemporary look. 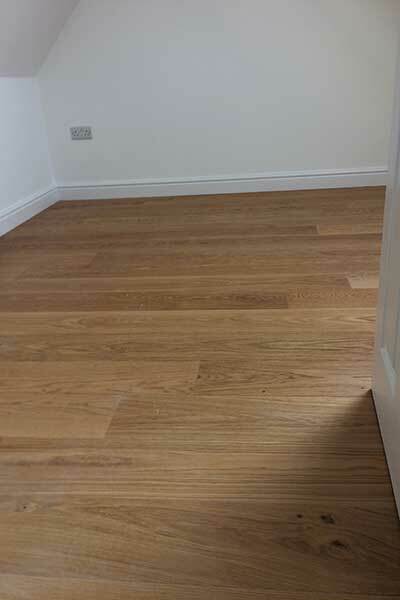 The flooring was installed on a sound reducing underlay, which was a criteria that was important to our customer. 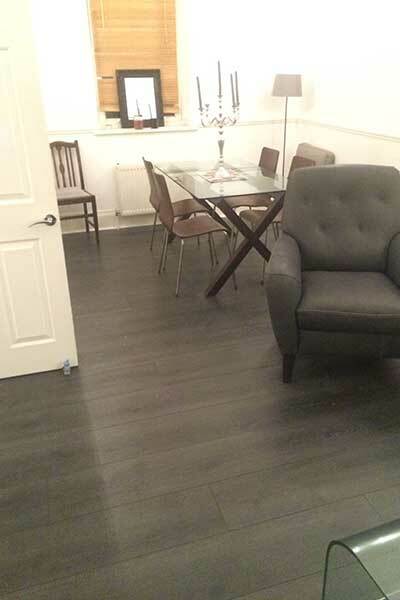 You will also see from the photos, that the boards are long lengths 2.2m and 180mm wide, which looks great in the main large area. 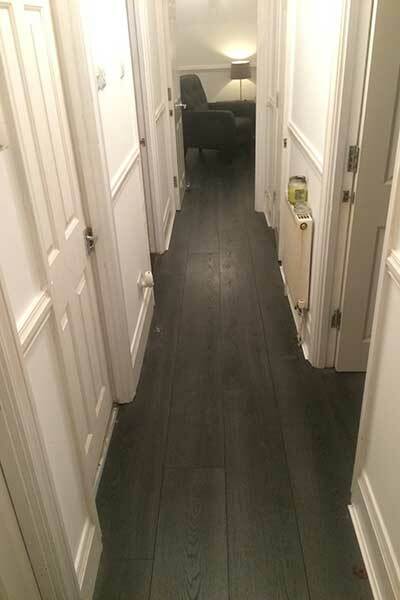 Customer chose a hand scraped, smoked and oiled with a satin finish to give the flooring a slight sheen. The colour is very rich and warm with natural tones, which goes really well with neutral soft grey walls. 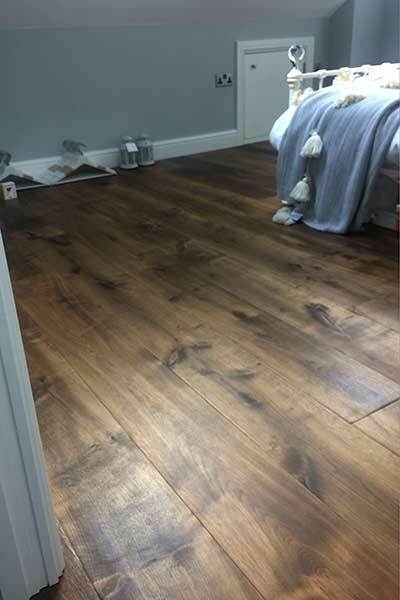 The Hand scraped effect is a way of distressing the flooring to give it a worn look. 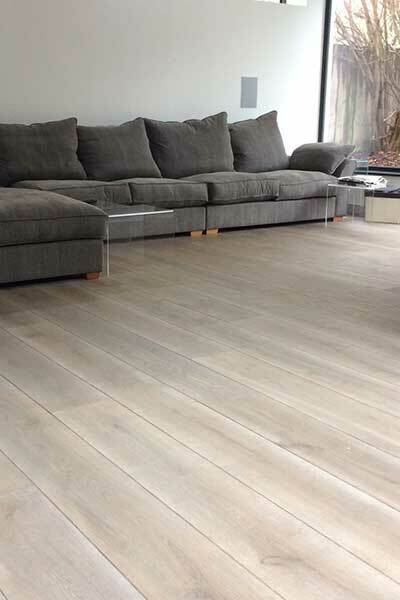 It is great to see mixed styles such as traditional flooring like this in a contemporary space. 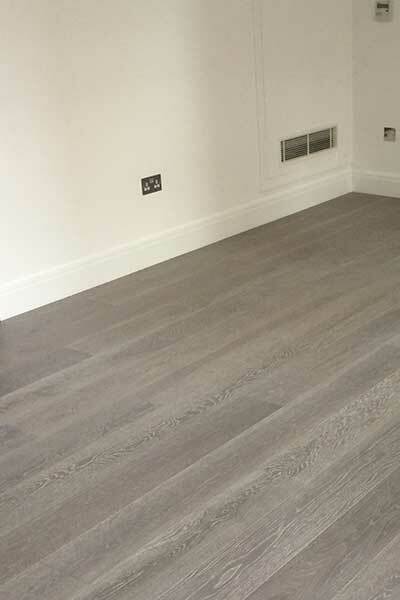 The flooring was fully bonded using strong flexible flooring adhesive to achieve a firm feel to the overall finish. 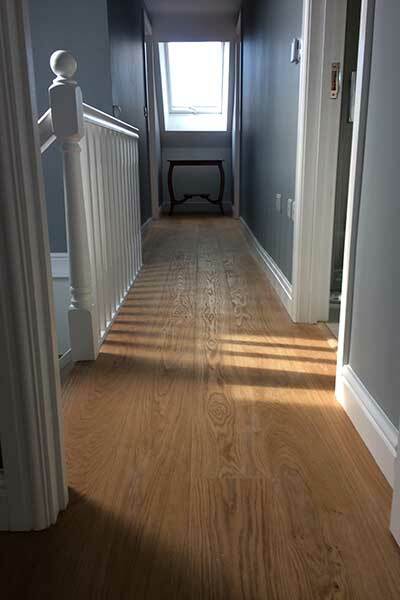 Our customer was so pleased with the results, we have been asked to do the whole of the first floor and ground floor lounge and hall in the same product.